In WebSite X5 the website Map has a typical tree structure: it stems from the Home page and branches out into the various levels, where all the pages are. Every website map has a Home page and a varying number of pages linked through the menu. As you add pages, you organize them into the various levels of the menu. Remember that the levels in WebSite X5 are categories and not real pages with content. Levels contain pages. Separators don't have content either. They are used to visually organize the navigation menu. Your aim, when designing the website Map, is to create a logical structure for the website contents, so that visitors can find the information they are looking for easily. ▪ In the window of Step 3 - Sitemap Creation use the New Level, New Page and Separator buttons to add new levels, pages and separators to your Map. ▪ Name the items in the Map carefully: these names appear in the navigation menu and as file names. If you want to change a name, click twice on it or use the Rename button. ▪ You can edit the Map at any time, moving pages, levels and separators to different places: select the item you want to move and drag it to a new position, or you can use the Move up / Move down buttons. ▪ Click a second time on a selected level, page (including the Home page) or a separator to rename it (instead of using the Rename button). You can also rename the aliases for Special pages in the Menu folder, but you cannot rename the Special pages themselves. ▪ After selecting a page, click on the Page title or the Description to change the text (otherwise you will have to re-open the Page Properties window to edit the text). ▪ You can double-click on a level to expand and view all the pages at that level, and double-click again to collapse it (this is quicker than using the Expand and Collapse buttons). You can also expand and collapse a level by clicking on the arrow in front of its name. 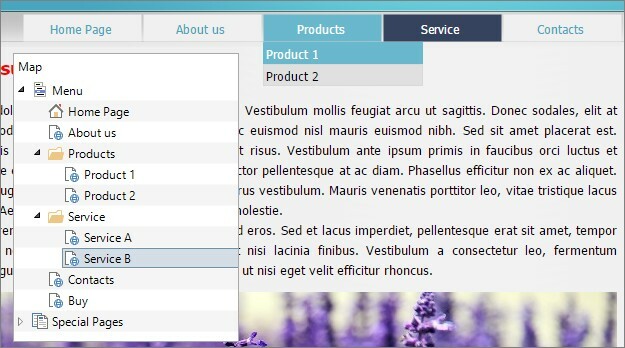 ▪ Double-click on a page to open the Page Creation window, where you can create the page. ▪ Double-click on a Special page to open the Step 1 - Website Settings | Advanced window, where you can create/edit it. ▪ Select a level and drag it to a new position, taking all its pages with it (instead of using the Move up / Move down buttons). ▪ Select one or more pages and drag them to a new position (instead of using the Move up / Move down buttons). Use the CTRL + click or SHIFT + click combinations for multiple selections. Multiple selections can include Hidden or Locked pages. ▪ Select the Menu folder and hide the navigation menu, clicking on the Hidden button. ▪ Select a Special page and drag it to the Menu folder (to the pages and levels that will make up the navigation menu) to create a level that acts as an alias for the Special page. This level will have the same name as the Special page and a link to it. By doing this, you can provide a link in the navigation menu that will go directly to the results page of the built-in search engine, the Entry page, the Blog, the Access/Register page or the e-commerce shopping cart. ▪ Select one or more pages and copy and paste them to another place in the project, or to a different project that you can open in another window of the program. You can use the commands in the tool bar, in the popup menu (rightclicking the mouse) or with the CTRL+C and CTRL+V key combinations. Remember that you cannot copy and paste Special pages.